It will be in February tomorrow. Will you want to prepare something for the tax report for 2015 ? February maybe still earlier for a tax reporting work but we can start to collect related information and prepare something now. The one of important things is getting a Tax Report Software. The tax report season comes again, we need software to help us reporting. We tried to share the free and certified tax reporting software annually, here is the software for last year. Compared with the last year, we found seems there are fewer full free but certified tax reporting software this year. However, we believe there are stronger functional software for mobile devices in this year. Check Canada Revenue Agency official site to get the free with certified tax reporting software. When you report annual tax, you might need to check all kinds of rates, such as the US to CA dollar convert rate. Canada Revenue Agency actually lists All Rates here. About money convert rate, check Currency exchange rates in the list, You will be accessed to Bank of Canada official website, then you have to search the rate type which you wanted. You can find Monthly and Annual Average Exchange Rates here . There are more and more free and certified tax report software in Canada. 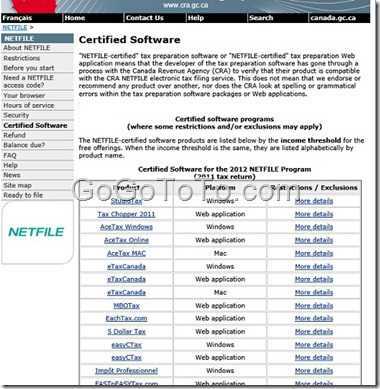 So people do not need to buy a software to do NETFILE report. 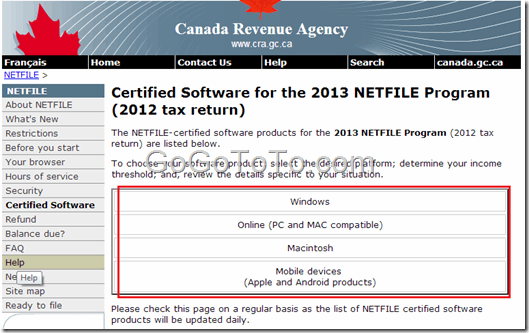 Every year Canada Revenue Agency official site provides a list including free and non-free tax software. And, this list is longer that previous year. The interesting thing is that this year we see there are even several software for mobile devices, you can use your iPhone, or iPad to report tax. In last year, we posted an information about “Why you have to buy a tax software”, the title was not correct actually, we wanted to say “You do NOT need to buy a tax software” because there are multiple free software with government certified. If you just claim your personal tax, they are enough to you. This year, certified tax software listed in here. You can choose a software which fit on your system. for example: if you are using Windows system, then you can click “Windows” and choose one, for most popular free and great software is still StudioTax. Why You Have To Buy A Tax Software ? In Canada, you have to report annual income tax return. Some people paid professional financial person or company to help the tax stuff; but some people report the tax by themselves, they bought tax software to generate tax returns files and then use Canada Revenue Agency official online service to submit the generated file (Normally, the file has an extension name .tax). However, you might not need to buy a commercial tax software because there are more and more free but "NETFILE-certified" software packages which you can choose. and they are listed on CRA official site also. I think for personal and family tax stuff, the free software package is enough. because most of people do not need to very powerful software. The important thing is: those free software got Canada CRA certified already, so normally you can use them without too many worries. You can find more detail information from CRA site. Visitors in Canada Should Do Income Tax Reporting ? In Canada, not only Canadian citizen, Permanent Resident, but also some visitors need to report income tax. For visitor, if you are a deemed resident for tax purposes. you should report income tax, most of time, you will get money back, not pay money to Government if you do not have income but just spent money when you visit or travel in Canada. So how do you know you are a deemed resident for tax purposes or not ? – are not considered a resident of another country under the terms of a tax treaty that Canada has with another country. the days you spent on vacation in Canada, including on weekend trips. If you lived in the United States and commuted to work in Canada, do not include commuting days in the calculation. personal property in Canada, such as a car or furniture; and social ties in Canada. About more detail, please read Canada Revenue Agency official site. Tax Report in Canada is very important. Every year, each Canadian and valid resident has to report tax. When report tax, we need to know some concepts, here we talk about Tax Year, Calendar Year and Fiscal Year in Canada. In Canada, normally Tax Year means the year period of income tax reporting. It very similar with Fiscal Year. In Canada, a Tax Year start from January 1 to December 31. The amount of income tax that an individual must pay is based on the amount of their taxable income (income earned less allowed expenses) for the tax year. A fiscal year (or financial year, or sometimes budget year) is a period used for calculating annual ("yearly") financial statements in businesses and other organizations. In many jurisdictions, regulatory laws regarding accounting and taxation require such reports once per twelve months, but do not require that the period reported on constitutes a calendar year (that is, 1 January to 31 December). Fiscal years vary between businesses and countries. The "fiscal year" may also refer to the year used for income tax reporting. Calendar Year is from Calendar, it is start from January 1 to December 31 normally. Please read Wikipedia for more detail. Above all, in Canada, looks like the period of Tax Year, Fiscal Year and Calendar Year are the same.